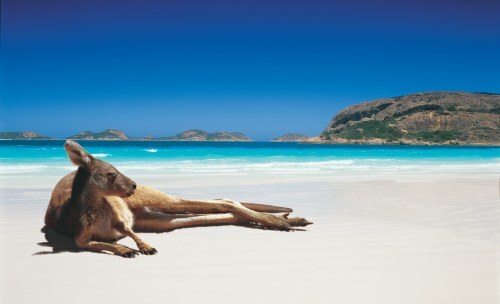 China Southern has dropped the price of their flights from Vancouver to Perth, Australia down to $899 CAD roundtrip including taxes. China Southern is actually a pretty decent airline, better than the other airlines based out of China, with a 4-star Skytrax rating. These 1-stop flights are fairly close to as fast as Vancouver to Perth can be done. This is 33% below the typical best roundtrip prices from Vancouver to Perth. Or, if you try searching on Momondo you may find them for $875 CAD roundtrip by clicking through to Gate1. vancouver, yvr, flight deals, china southern, australasia, australia, perth, per and oceania. 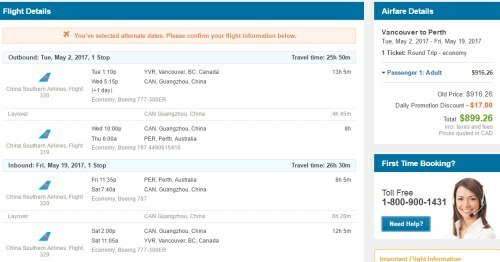 One Response to "Vancouver to Perth, Australia - $899 CAD roundtrip including taxes"
I've flown both China Eastern and China Southern. For the price you pay, I think its the most affordable way to get to Australia. Cannot complain about the food (I even requested for a special meal) and both airlines were brilliant. The transit time is a bummer but a movie and a walk through the airport, its time to board. I would definitely fly them again. A saving of $700, a $10 coffee at the airport is still a bargain.